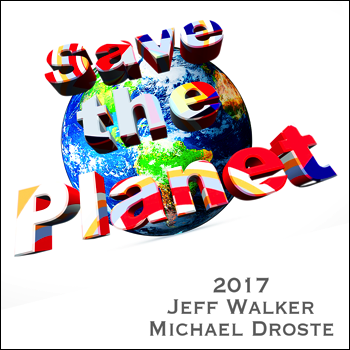 Michael Droste and Jeffrey Walker, two teachers from Illinois, teamed up to create a song called Save The Planet. "We wanted a way to reach students, parents and everyone about this issue - and what better way than through a song," said Jeff. The song gives you easy, simple steps, that you can take to make the world a better place for you and everyone on the planet. "We wanted to emphasize points that every person on the planet can do, such as: water and energy conservation along with recycling plastics and paper," said Jeff. (This message is found in the middle of the song.) Mike stated, "We wanted to bring people's attention on how we have damaged the earth from dumping garbage in the oceans and cutting down the forests." But besides emphasizing the problems, the song was written by the duo to bring a message of hope and positive change. "By people of the world working together and getting involved - we can make the changes needed to clean up our home." "Songs are a very fun and yet strong way to get a message into people's minds through a melody that people don't forget," said Jeff. The duo hope to get their message of positive change out to the public. Here is a lyrical quote from the song: "...with everyone working together we can turn this thing around." Many who have heard the song, go away humming the melody about ways in which they can "Save the Planet." Many thanx to those that have emailed in ideas and tips. 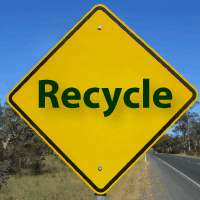 DO Recycle plastics, paper and rubber according to your town's recycling program. Use them for drainage in the bottom of plant pots or hanging baskets. Use them as packaging material. Use them as 'doggy bags'. Most supermarkets will take and recycle plastic bags. Buy a blue recycling bin (or bags) and throw all unwanted paper or cardboard into it. Most major cities in the U.S. will pick it up and recycle. Use wrapping paper, bows, ribbons, and boxes for presents. Use old children's drawings and paintings to wrap presents. Use old envelopes can be used for shopping lists, to-do lists, and notes. Use old calendars, colorful pictures, etc. can be used to make your own envelopes. Give old magazines, book to friends. Use aluminium trays from pies under potted plants. Use egg cartons, plastic bottles, or take out containers for planting seedlings. Lawn clippings can be used to cover weeds. Use plastic ice cream containers for seed labels. Use plastic bottles to hold tools and nails etc in the shed. Water your lawn only when it needs it OR not at all. Set your sprinklers for more days in between watering. Think about converting your lawn to native plants. Don't water the sidewalks, driveway or gutter. Adjust your sprinklers so that water lands on your lawn or garden where it belongs--and only there. Turn off the water while shaving. Don't defrost frozen foods with running water. Use the garbage disposal less and use garbage can more. Dispose of hazardous materials properly. One quart of oil can contaminate 250,000 gallons of water. 1 lb of hamburger or steak uses some 2,600 gallons of water. Producing 1 lb of bread requires 500 gallons of water. Producing 1 serving (8 oz.) of chicken requires 330 gallons of water. Growing one cotton T-shirt requires 256 gallons of water. Producing 1 egg requires over 100 gallons of water. Producing 1 serving (8 fl. oz.) of milk requires 48 gallons of water. Producing 1 serving (2 oz.) of pasta requires 36 gallons of water. Producing 1 serving (4.6 oz.) of oranges requires 14 gallons of water. Producing 1 serving (4.3 oz.) of tomatoes requires 8 gallons of water. American Thanksgiving dinner for six people requires over 30,000 gallons of water. The average house uses about 38 percent of its total annual energy use on heating. Install a central air conditioning system only when whole house air conditioning is needed. Replace aging appliances with newer energy efficient models. Set your home thermostat as low as comfortable (65 to 68 degrees F is suggested) when the house is occupied. Set back the thermostat by as much as 10 F at night or when the house is unoccupied during the day. Install a programmable thermostat to automatically provide the setbacks mentioned above. Close the fireplace damper except during fireplace use. Replace furnace filters once a month during the heating season. Remove any obstructions and clean heating registers regularly. Have certified maintenance personnel service and check your furnace regularly every three years for gas fired furnaces. Install storm windows over single pane windows. Replace aging furnace, when needed, with an energy efficient model. Replace single pane windows with energy efficient double pane windows mounted in non-conducting window frames. Reduce the temperature setting of your water heater to warm (120 F). Add an insulating blanket to your water heater. Wash clothes in warm or cold water using the appropriate water level setting for the load. Replace water heater, when needed, with an energy efficient model. Open windows at night to bring in cool night air; close them during the day. Draw cool night air into the house with a whole house fan. Use room air conditioning only where needed and install energy efficient models. Install a central system air conditioner only when whole house air conditioning is needed. Maintain an air conditioned house at 78 F or higher. Plant deciduous shade trees on the west and south sides of your house. Maintain refrigerator at 37 to 40 F and freezer section at 5 F.
Maintain stand alone freezer at 0 F.
Choose a refrigerator/freezer with automatic moisture control. Use toaster oven for cooking small meals. Adjust the flame on gas cooking appliances so itís blue, not yellow. Run the dishwasher only with a full load of dishes. Regularly clean the lint filter on your dryer and inspect the dryer vent to ensure it is not blocked. Replace aging major appliances, TVs and VCRs when needed, with energy efficient models. Compare the annual energy consumption and operating cost for each appliance by looking at the Energy Guide label when shopping for new appliances. Use task lighting whenever possible instead of brightly lighting an entire room. Install compact fluorescent lamps in the fixtures which receive high use.